Compact Model 534 canners vacuum pressure gauges are specially designed for testing the vacuum in canned food and drink products. 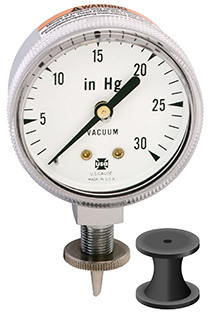 These easy-to-use, destructive sampling testers use a rugged stainless steel needle to puncture the container, while a rubber gasket provides an airtight seal for an accurate vacuum pressure reading. The non-removable needle is easily cleaned for multiple use.